This data set can be used to identify constructed drains, which are watercourses in the form of ditches, natural watercourses that have been modified to improve drainage, or buried tile systems. This data is for illustrative use only and is not to be used as a precise indicator of features. Please use caution when interpreting data and results. Legislated or Legal Authority for Collection: Drainage Act (http://www.omafra.gov.on.ca/english/landuse/drainage.htm#act). Drainage Legislation Fact Sheet (http://www.omafra.gov.on.ca/english/engineer/facts/89-166.htm). Additional Time Period Information: The date specified is representative of when the Drainage Act was implemented but OMAFRA may have data included within the data set that was constructed prior to that date. Measure Description: Horizontal: Reliable: +/- 100 m; Vertical: Not Applicable. 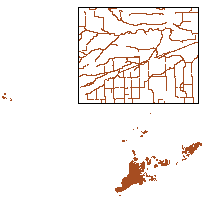 Ontario Ministry of Agriculture, Food and Rural Affairs (OMAFRA): Artificial Drainage System maps (ADS): Approximate spatial location of drains based on a 1:25000 scale. Data collected from 01/01/1980 to 31/12/1998. The source data set contains information about constructed drains and tile drainage areas. South-Western Ontario Orthophotography Project (SWOOP) project partners: South-Western Ontario Orthophotography Project Imagery (SWOOP Imagery): Helped to spatially locate some of the drains referenced on the hard copy mapping. The imagery was captured in the spring of 2006. Data collected from 01/03/2006 to 31/01/2006. The satellite imagery was 30 cm resolution. Department of Fisheries and Oceans: Engineers reports: Approximate spatial location of drains based on maps and engineers reports. DFO drain identifier and DFO drain classifications are provided. Engineer reports for the building constructed drains. Report includes a map of the constructed drain. Conservation Authorities: Digital drain files: Digital shapefiles and CAD files provided by Conservation Authorities. Information varies from different CAs but includes spatial location and drain identifier. Some CAs provide DFO classification and DFO identifier. Data sent to OMAFRA between 01/01/2006 and 31/12/2008. The source data set contains information about constructed drains. Municipalities: Digital drain files: Digital drain data in the form of shapefiles and CAD files. This source data set contains constructed drains records and attribute information.